The Mokau Museum has been established by the Tainui Historical Society to display the collection of artifacts that are of interest to the Tainui area. The society’s purpose is to collect, preserve, document, research, display and otherwise make available taonga, natural history and cultural heritage relating to the Tainui region. 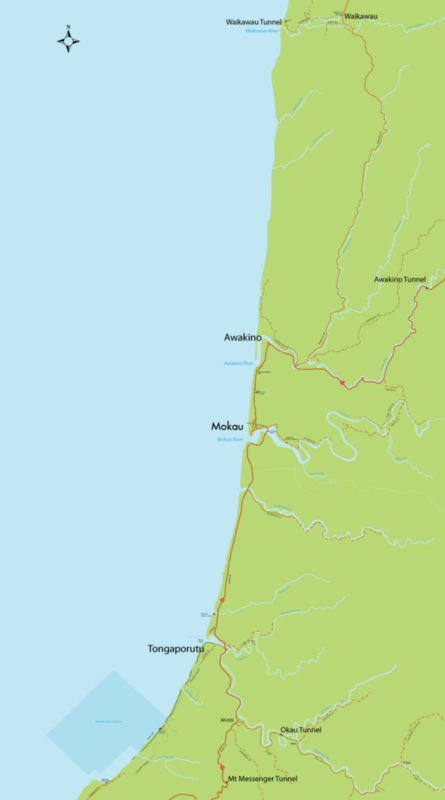 This geographical area is loosely encompassed within the four tunnels of Waikawau, north of Mokau, Awakino, northeast of Mokau, Okau to the east and Mt Messenger in the south. The Tainui Historical Society was established in 1980 and started with an assortment of documents and photographs that had been collected and displayed in the local hardware store. These were gifted to the Society when the store closed down. In the early 1990s the Society started plans to have a community museum to house and display their growing collection. By 1995 a purpose built museum was opened on land that had been donated to the Society. This was filled with community history and became a ‘house of treasures’ as one of our volunteers proudly proclaims to every visitor through the door. One very generous donator bequeathed 14 small truck loads of artefacts. It wasn’t long before the museum was bursting at the seams however. In 2012 an extension was built which linked the museum building to the original dental clinic and jail which had been placed on the site. In early 2016 the team from Heritage Rescue visited the museum and helped us to reorganise the layout. We also added an art gallery about the same time which features a variety of artists with changeovers every 6-8 weeks. The Museum’s collection consists of approximately 3000 artefacts including taonga, social history and natural history. Numerous photographs and archives make up the rest of the collection. The photographs show events, features and people of the region, while maps and newspaper articles add another dimension to the collection. Genealogical material enables people to research their history and whakapapa which brings a personal touch to many with ties to the region. The Museum is a member of Museums Aotearoa and as such follows the Museums Aotearoa Code of Ethics 2013 which includes observing the principles of the Treaty of Waitangi in the application of its exhibition, collection, and activity programmes.